This is a recording of Greg’s voice where he reads out his text for the Conference that commemorated the 20th year following the Lucasville prison disturbance of which Greg fell a victim. A new flyer for Greg made by supporters. 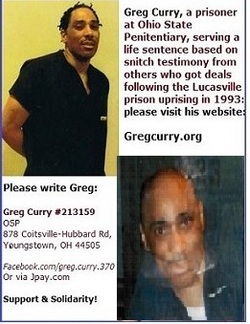 Posted in 20 year anniversary conference, 2013, Lucasville and tagged 20 year anniversary conference, 2013, Greg Curry, Lucasville on May 9, 2013 by Justice for Lucasville Prisoners.